UPGRADE TO TG PRO FOR FREE AFTER PURCHASING AND RUNNING ONCE - download at http://tunabelly.com/tgupdate. 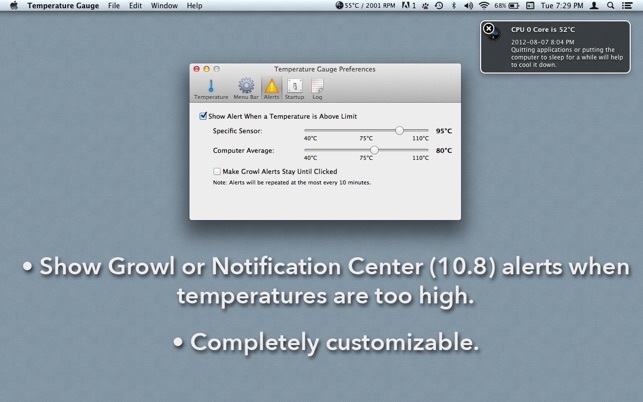 FAN CONTROL AND NEW FEATURES ARE ONLY AVAILABLE AFTER UPGRADING FOR FREE TO TGPRO. We are no longer allowed to update on the Mac App Store which is why we're offering the free switch to TG Pro after purchasing. I don’t think this app is calibrated accurately. I noticed this when temperatures were behaving very erratically. I decided to put it to the test on my Macbook Pro Retina. On startup on a cold morning in my office (5ºC), the temperature would immediately show 72ºC. Throughout the day I tried cooling my Mac by resting it on top of a fan operated cooling base for an hour, turning off all third party applications, and temperatures would still sometimes get up to 82ºC without any use; even when the aluminium casing got noticeably cold to the touch. It also showed high fan speeds at 2083 RPM when there was no fan noise coming from the computer. 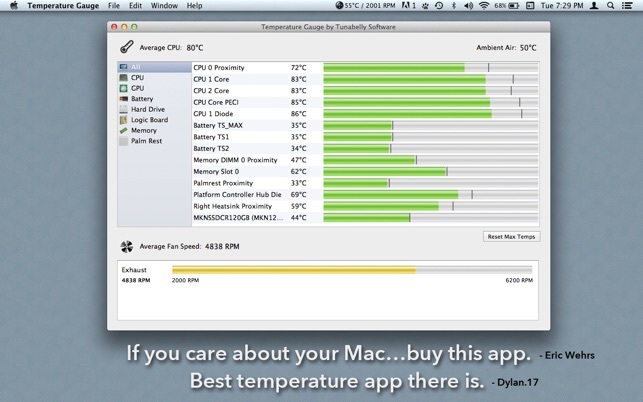 Anyone, like me, might believe that this app is set to show higher than real operating temperatures. Afterall these Macs are designed to operate from low storage minus temperatures, and I would not expect the diodes then at startup to run at nearly the boiling point of water! Please can the developer test this app’s accuracy. 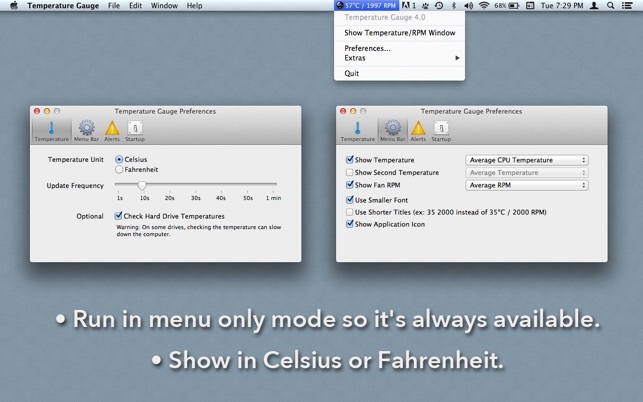 This app is just what i hoped it would be it allows you to monitor the tempreture of all the key components in your mac. If you want to care for your apple product and have the peace of mind that your machine is going to last a long time without faults in furture this is definitely one to consider. my only downside of this app is being unable to control any of the fans which is probably for the best but when my computer does get hot doing intensive tasks like gaming or video zediting the only choice i have to cool my computer down is to close the application and let my computer sit idle. all in all this is a must have for any technology respecting user who wants there products to last and perform day in and day out. This app does everthing it is supposed to do. I have a late 2012 iMac (27” with i5 Intel quad core) and although I have never had any issues with my Mac I am still a bit paranoid about how a powerful computer can comfortably keep cool in such a narrow case, but now my paranoia has been cured! Every sensor gives real time data to the on screen display, even the ambient temperature is displayed. 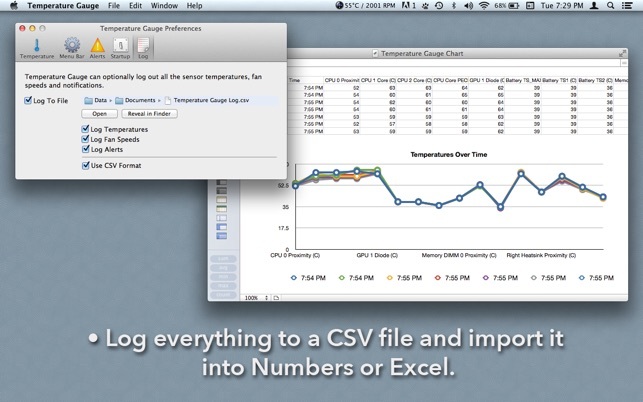 I would recommend this app to anyone with a Mac or MacBook, it’s a small price to pay for peace of mind. © 2016, Tunabelly Software Inc.